You wouldn’t know it from some of my posts reliving memories and celebrating the recipes, but in March of 2013, I stopping eating bread and pasta. I know. Sounds crazy. It is crazy. I thought it would be impossible to maintain and had no hopes of sticking to it since I had never, EVER, been on any kind of a diet in my life. But my doctor told me every year that my weight and cholesterol were inching up and she was concerned that I wasn’t exercising enough. I was too tired to exercise and didn’t really know how to diet but I knew I needed to do something. And then I was introduced to a way of eating called Paleo. At first, I thought Paleo sounded impossible. But the more I read, the more intrigued I became. All the scientific explanations and testimonials about the Paleo diet made sense to me but I was pretty sure I didn’t have the willpower to sustain it. Or the desire to maintain it. I love my food! All of it. I decided to give it a try by just giving up bread and pasta and see how I felt. It was surprisingly easy because I didn’t try to limit anything else. I ate what I wanted except for bread and pasta. It has now been over a year of my new way of eating. I never went fully paleo as you will notice from my instagram posts, still enjoying a bit of dairy and the occasional rice or other gluten-free grain. I love my wine and occasional sweet. And I try to never impose my diet on others, not worrying about a meal here or there that includes legumes or grains. A few bites here and there don’t seem to derail me and for the most part, I stick to it and I find it fairly easy to maintain, filling and satisfying, and terrifically varied. My weight stabilized after the first 8 months, with the total loss being around 14 pounds and that is where I have magically just stayed no matter how much I eat or don’t eat. My doctor was amazed. She was most impressed with my cholesterol which went from 240 to 186 with the entire loss being in the bad cholesterol category (LDL). She asked me what on earth I had been doing since she had not seen my weight nor my cholesterol go down in the past 10 years. She wasn’t at all surprised when I told her I was eating mostly Paleo. She had heard of the results from others. The hardest part about this type of diet for me is breakfast. For nearly five decades, (yes, 50 years) I had grains for breakfast every single morning. Toast, cereal, granola, oatmeal, muffin, bagel….always something with grains. And then I stopped. I don’t know why, but I had never thought of chopping a sweet potato for breakfast. In my mind, they were mashed or made into fries. But they are so easy to peel and then if you chop them into small cubes, they cook quickly and easily for a perfect savory side dish or base for poached eggs. Baby Girl and I still wonder why everyone call yams sweet potatoes but we did a taste test and we definitely prefer the sweet potatoes even if they aren’t always the beautiful orange color of yams. You can use yams or sweet potatoes or both for this recipe and the best part is…you can cook up a large quantity of the hash at dinner time and use it for breakfast all week long! Thank you Amateur Gourmet. Get your poached eggs started. 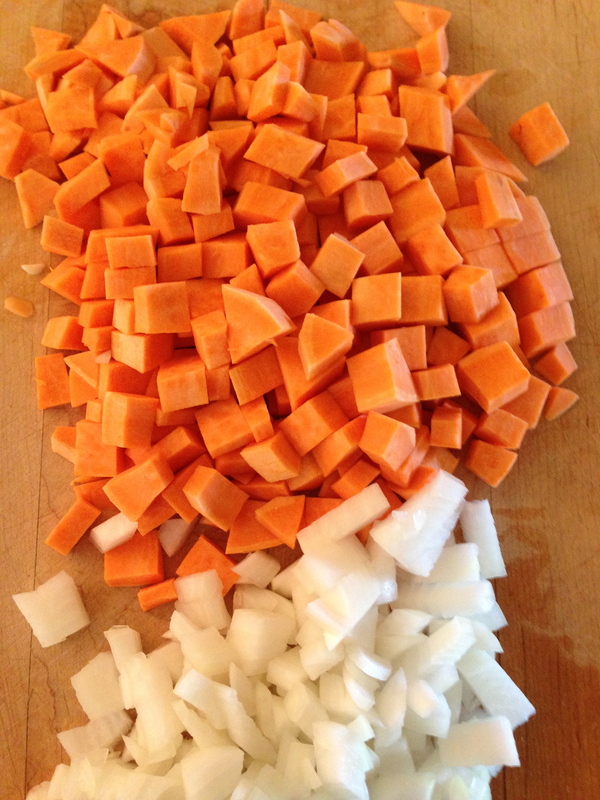 Put coconut oil in a hot pan and add the sweet potato and onion. Cook over medium/high heat stirring frequently, for about 5 minutes or until sweet potatoes pierce easily with a fork. Stir in the spices and cook 1 more minute. Remove from heat and allow to sit until eggs are ready. 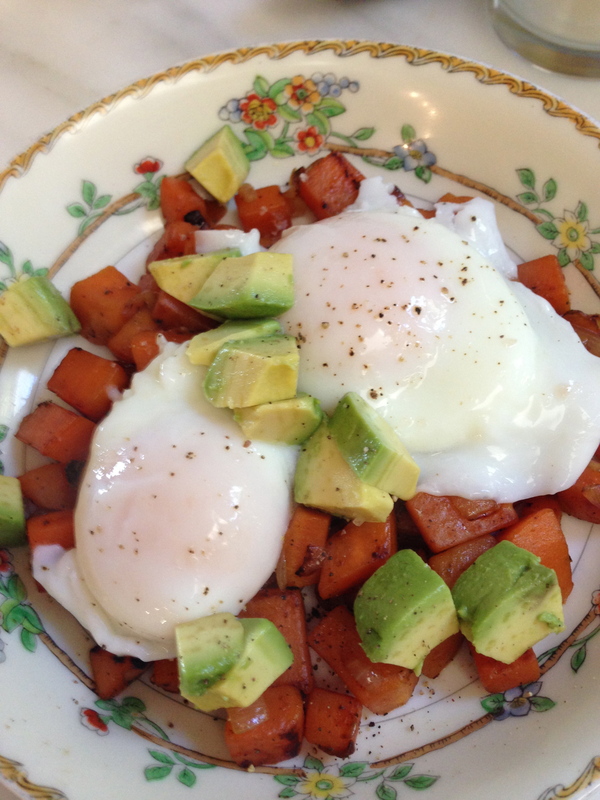 Scoop a generous helping of sweet potatoes onto your plate and place drained poached eggs on top. Garnish with avocado and enjoy. *For the perfect poached eggs, go to Dad’s Poached Eggs. I just made this for my post-workout breakfast – Yummy!! Love the way you write.It felt like a vacation in Maine as I sit at the computer! Giving it a whirl. Going Paleo .